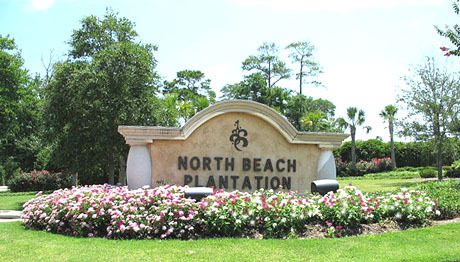 North Beach Plantation has become the premiere luxury planned community in North Myrtle Beach, sprawling from South Ocean Boulevard in Windy Hill to Highway 17, it encompasses about four square blocks just across from Barefoot Landing. Offering condos, townhouses, cottages, beach houses, and luxury estate homes, North Beach has something for every taste, and an on-site rental management that offers in turn a residential vacation complex that has no equal. Perfect for a primary residence or vacation home, all owners and guests have use of the wide range of amenities offered in 2 acres of water park located behind the oceanfront condo towers. Walk, bike, or drive your golf cart the few short blocks to the beach. When it comes to homes and cottages, North Beach has every kind and size. Originally, building started in the mid 2000's with just the Towers and a group of cottages that are surrounded by flowers, palms, and other Hawaiian-like landscaping. Since then, many other neighborhoods of homes have been built, and the final additions of the huge estate homes in Whitepoint are still being constructed in 2015. If you have been looking for a new luxury home in North Myrtle Beach, we urge you to see the new homes in North Beach Plantation first. With lots of room for guests and easy access to the community amenities on Windy Hill's beach, The Cottages at Margaret in North Beach Plantation offer the perfect place to make yourself at home and to share your vacation with family and friends. Priced from the upper $300,000's to the high $500,000's, these rainbow colored Charleston cottage-style homes come in a variety of 1 and 2 story floor plans with 3 or 4 bedrooms, each with its own private bath. The elegant landscaped streets are lined with flowers and palmetto trees that would make any gardener envious and envelopes the senses with color and fragrance. These are the original homes built, and have already established themselves as a vacation favorite as well as a community of happy full time residents. The luxury homes in Banyan Estates in North Beach are the ultimate in smaller executive homes. Brightly colored, 2 story, 3 and 4 bedroom homes here are made to enjoy the beautifully landscaped community. Multiple porches, large windows, and even private pools can be found in Banyan. Some have outdoor cooking and dining facilities as well as outdoor fireplaces. Built in 2011, the homes in Banyon Estates range from $500,000 to about $900,000 or more. It is rare to find one for sale, so if you are interested in one listed, call us immediately to be sure if aren't left out of a dream home find. Appleton is a neighborhood of both townhomes and single family homes. Homes are three bedrooms but vary widely in terms of space. Both 1 and 2 story homes offer such upgrades as high ceilings, 2 covered porches with tile flooring - one screened. large kitchen, granite counter tops, large bath with glass enclosed shower, and much more. Prices for Appleton run just under $300 to $430,000, with 3 different floor plans from 1300 sq ft to 2100 sq ft. Finding one for sale now is rare. These beautiful and brightly colored homes are popular for vacation rentals as well as primary homes. Built in 2011, they're just old enough to have the landscaping mature and have repeat renters if you're interested in the rental income. Whitepoint has a few homes that were built around 2011, but the majority are either brand new or under construction. This neighborhood is the closest to the beach and the Towers, including the pools and other fantastic amenities. There are 2 and 3 story homes priced from $500k to over a million, and many have private pools, elevators, multiple balconies and even inspiring ocean views from the top floors. Whitepoint homes are second to none in North Myrtle beach except perhaps some of the oceanfront mansions in Cherry Grove. Get in on the purchase while it's being built so you can choose colors and decor. These are truly magnificent homes!